While driving, running out of phone battery and not being able to find a suitable place to place your phone are the two common problems for every driver. However, with advanced technology, DBnice 3-in-1 wireless car charger mounts have been created. This wireless charging solution would also grip your phone securely so that you can use it as a hands free GPS monitor. More than a wireless car charger： you can also mount it in your living room, dinning room,office etc. ❤【WIRELESS CAR CHARGING】❤: The car wireless charger is available for Samsung Galaxy S9, S9+, S8, S8+/S8 Plus, S7, S7 Edge, Note5, Note7, S6 Edge Plus, iPhone8, iPhone8 Plus, iPhone X and all devices that support wireless charging. ❤【FAST CHARGING TECHNOLOGY】❤: for about 1.5x faster than other wireless chargers. A unique feature of DBnice Qi car charger is the two modes of wireless charging. The first mode is the fast wireless charging mode, which would output a maximum of 10W for Galaxy S9 S8 etc.. The second mode is the Standard wireless charging mode, which outputs a maximum of 5W for iphone 8/8plus/X. ❤【3-IN-1 MOUNT】❤: DBnice portable wireless charger comes with an air vent mount as well as a suction mount. 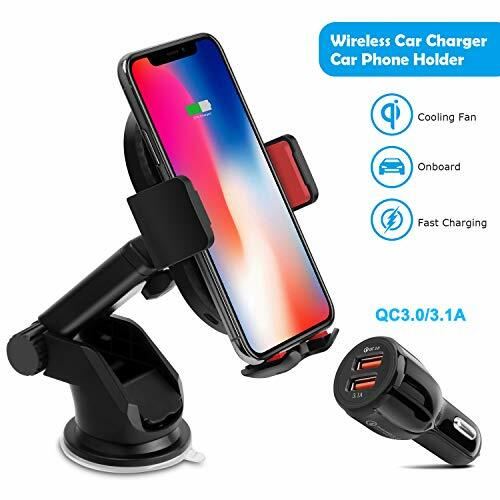 So you can either go for the air vents of your air conditioner or choose the suction mount to fix the wireless charging car mount on your dashboard/ windshield, you can fix this portable wireless car charger anywhere, you prefer in your car. The 360-degree rotating ball joints support landscape and portrait orientations. ❤【MULTIFUNCTIONAL USE】❤: DBnice Wireless mount car charger can be used not only for car vent installations, but also be used for office, home, dashboard or any place you want to use. ❤【SECURELY and EASY TO SETUP】❤: This charger is affordable, practical and easy to use. The holder has rubber cushions on the inside, hold your phone securely to protect your phone from getting scratches! If you have any questions about this product by DBNICE, contact us by completing and submitting the form below. If you are looking for a specif part number, please include it with your message.